John LewisThe 2014 John Lewis Christmas ad. Good morning. Here is everything you need to know to set you up for the rest of the day. 1. The most anticipated UK advertising event of the year is here: the new John Lewis Christmas ad. 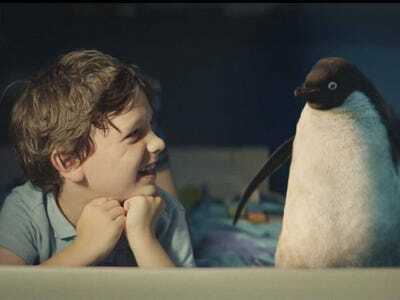 This year the commercial tells the cute tale of a boy and his CGI penguin stuffed toy friend. 2. Steve Jobs’ former right-hand ad man Ken Segall has told us he thinks Apple’s advertising has become “soft” and “ordinary.” Segall, the former creative director at Apple’s ad agency TBWA/Chiat/Day, thinks there’s probably too much tension between marketing chief Phil Schiller and Apple’s agency. 3. We have a conspiracy theory about the viral teen sensation “Alex from Target.” Several signs point towards the social media hit being a setup by Target all along. 4. The widely-loathed Spirit airlines has launched a tongue-in-cheek digital campaign to share what people hate most about flying. The budget airline’s “State of Hate” report takes aim at its more expensive rivals. 5. Whole Foods is whipping traditional supermarkets. The company is expanding, updating its loyalty program and app and expects sales to increase 9% next year, as consumers seek out more speciality produce. 6. Shaky third quarter results from the big US media companies suggest a “structural slowdown” in TV advertising, The Wall Street Journal reports. Marketers are pulling back due to economic uncertainty and shifting their spend to digital, the report suggests. 7. A Microsoft marketing ploy with CNN on election night backfired when certain camera angles revealed the network’s news anchors were merely using their Surface Pro 3 tablets as stands for their iPads, Gizmodo reported. This comes on the heels of NFL commentators calling the surface “an iPad” and “iPad-like,” despite a $US400 million deal to do exactly not that. 10. The Wall Street Journal’s CMO Today ponders whether marketers need a podcast strategy. The “Serial” podcast is the hottest show of the fall, the article suggests, adding that it might be time for marketers to revisit podcasts – a medium where audiences are extremely attentive.